Ideally situated, Lake County is in the center of the state, top to bottom, coast to coast. Central Florida offers the additional advantages of rolling landscapes and inland protection from hurricanes and salt corrosion. If you want to visit Florida's beaches, they're little more than an hour away in either direction. With over two hundred square miles of lakes, it's easy to see how the county got its name. Spend a winter here and you'll also appreciate why it's called "The Sunshine State." Thirty-one parks and over a dozen marinas and fish camps make Central Florida a fisherman's paradise. You're just minutes away from downtown Orlando, an international airport, national outlet shopping, and world famous attractions including Lakeridge Winery, the Florida Citrus Tower, Silver Springs, Ocala horse country, Universal Studios, Sea World and the most famous destination in the world... Walt Disney World's Magic Kingdom, Epcot Center, Animal Kingdom and more. A full-service restaurant on property. Diverse activities serving the specific interests of active adults supervised by full-time social directors. Easy access to all common areas. 18-hole golf courses with full-time PGA golf professionals and assistants on staff. 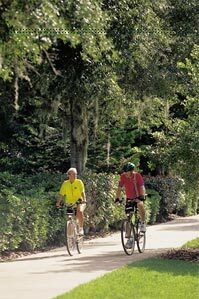 Each resident pays a low monthly homeowner's fee for the use and enjoyment of the common facilities. The fees include the 24-hour staffed security gate, tennis, softball, upkeep of the clubhouses, pools, spas, and common property including the community entrance, landscaped boulevards and village entrances; full-time activity directors, daily activities and events.